Like the 18th century colonials before us, I am typing this blog post using wifi from my cell phone's hotspot, and light from a candle to see the keyboard, as the power is out down here in the City. A warm, windy front is moving through, bringing some needed rain. It also brought down a power line. I was in the midst of cooking dinner when the lights flicked off, so I was a little annoyed (crunchy rice soup, anyone?) but I improvised, adapted, and overcame, and cooked most of my food on the grill outside with the waning twilight. Holding the flashlight to see if my Vermont-raised hipster chicken cooked through, I was wishing I had the bus and all of it's amenities. I could have cooked my rice and potatoes over the woodstove. I would have had bright lights for days, even with cloud cover, running off the batteries. Cell phones and computers could be charged with converted or inverted DC power. My resilient mobile homestead is designed to operate on it's own, and this is the first outage where I haven't had the ability to use it. Not having the bus has really made me think about how dependent we all are on "the grid." One tree goes down across an open, exposed power line in a wind storm, and at least dozens, maybe hundreds, maybe thousands of people are without light, and unable to cook their dinner. So the lights are out; now what? Many went into town for food. Some cranked over a loud, gas-powered generator to get their house running again (or not, because it has a dead battery and watery gasoline.) Some settle in and spend time with their family, eating cold leftovers, rooms illuminated with candles, the one flashlight that wasn't dead, and iPad screens. My family went with the latter. A friend of mine in school grew up in an off-grid house. When the power went out in her town, she had no idea! She'd come into school the next day wondering why everyone was complaining about not having a hot shower, or not having internet to finish their homework. At her house, there was no change! They weathered the power outage just fine, because they weren't connected to it. They weren't reliant on that power coming in off the pole. I didn't realize that an off-grid house wouldn't lose power in a storm until an embarrassingly late age. How much of what we pay in our electric bill goes to supporting the infrastructure? How resilient is our community, how vulnerable are we, when a single tree can disrupt the evenings of hundreds of people? Now imagine with me, that instead of our grid tied system, with thousands of power poles and thousands of miles of electrical wire, "gracefully" connecting all of our homes to a series of single-point failures... we have a community of off-grid homes. For electricity, these homes have solar panels up on the roof, a battery bank in the garage. 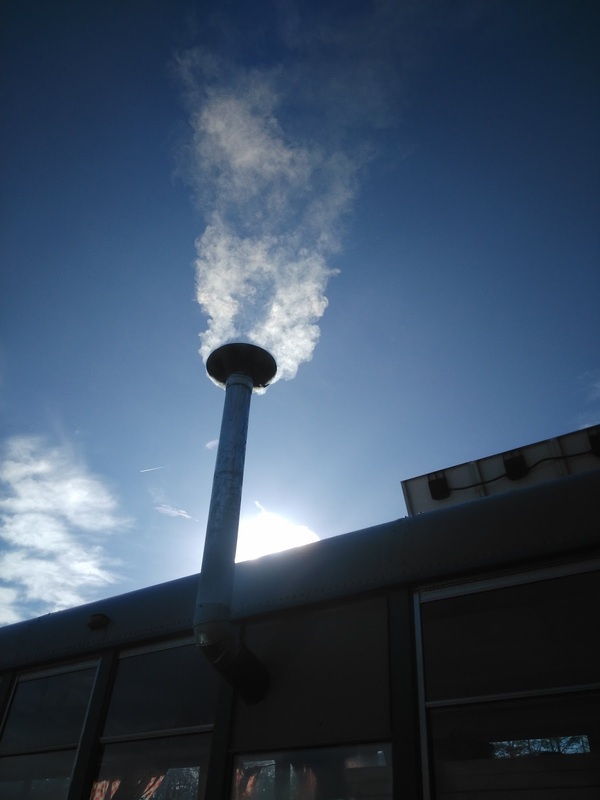 A wood stove may provide the heat for the home, or maybe a geothermal system. Let's go the extra mile and assume they have a small garden, and a few weeks of food stored... is there anything that this house, and that family, can't endure from Mother Nature's wrath in New England? How much stronger is the community, when a tree going down across the road doesn't take out power to hundreds of homes? How much stronger would our nation be if more people lived like this? Imagine all the people, living with no electric bill... and no power outages. Meanwhile, back in cold, harsh, oil-burning reality, I'm continuing work on tractors. I went up North on Day 10502 to finish "winterizing" the bus. I closed up all the windows, which had been letting it breath in the heat, and laid down some fresh sand in between the bricks under the woodstove. I cranked up the woodstove for some heat. When I got up North it was early, and still in the 40's. The bus warms up quick once the fire is going; it also cools down quick once it goes out! I have firebrick added to my to-do list; I'd like to put a layer in the firebox to take some of the heat, and dissipate it gradually. Otherwise, this thin sheetmetal stove takes all the heat it makes in the burn and radiates out from the hot steel, or sends the hot exhaust smoke up the chimney. I can slow down the burn with the damper and the air inlet... but the restricted airflow just makes for a dirty burn, which could load my chimney with creosote if I don't burn good dry wood. Can you tell I'm in the middle of a book about masonry woodstoves? Learning is happening. 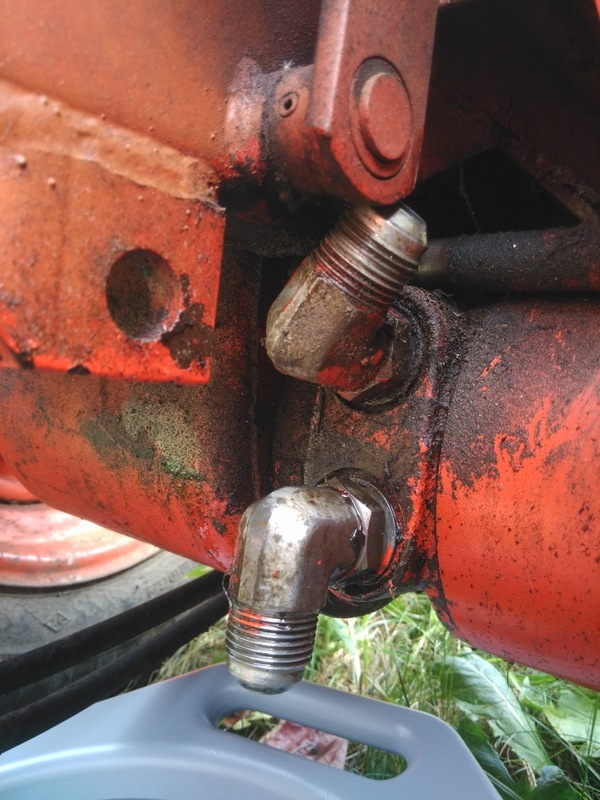 I wanted to fix the cracked driveline on the 444 tractor, so I needed to lift it up to get under it. I also realized the front tires were flat. 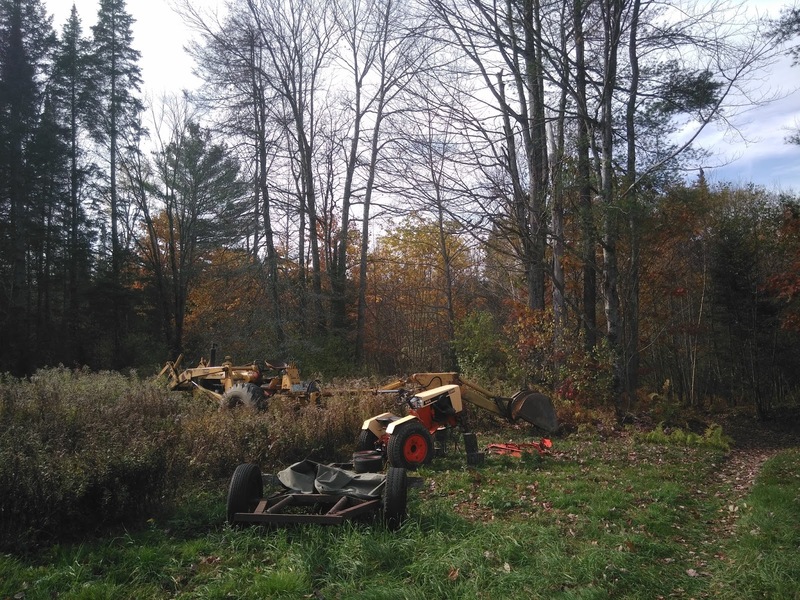 My dad had borrowed my farm-jack... what to do? A solution presents itself. With the tractor elevated, and the front axle properly shored with firewood (what can't be done with a backhoe, a chain, and firewood?) I began disconnecting the hydraulic lines. 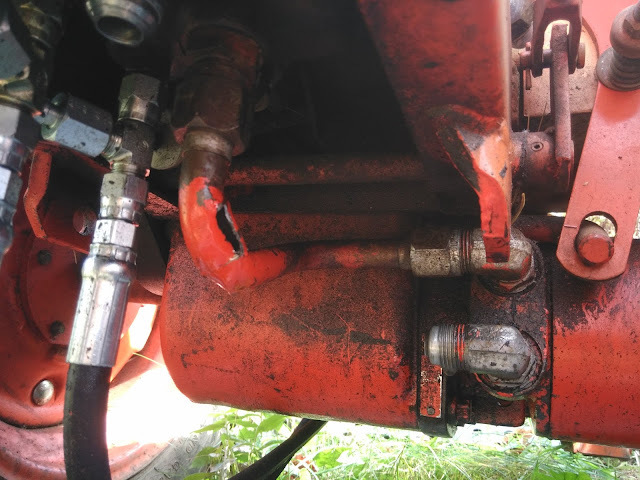 My intent was to replace the 444's forward and reverse hydraulic lines, from the control valve to the drive motor, with the lines and reducer from the 442 I parted out. The reducer on this machine ought to keep it from "running away" when it's in gear going down a hill, which is a "nice feature." One of the B-nuts was rusted tight, and the crack opened up and severed the line as I tried to loosen it. With the line removed, I needed to pull the two 90 degree fittings off the start motor so that I could install the reducer. I found that I couldn't remove the upper 90 degree fitting, because it wouldn't clear the tractor's frame. Hmmm... I don't think I'll be doing much more on this machine today. 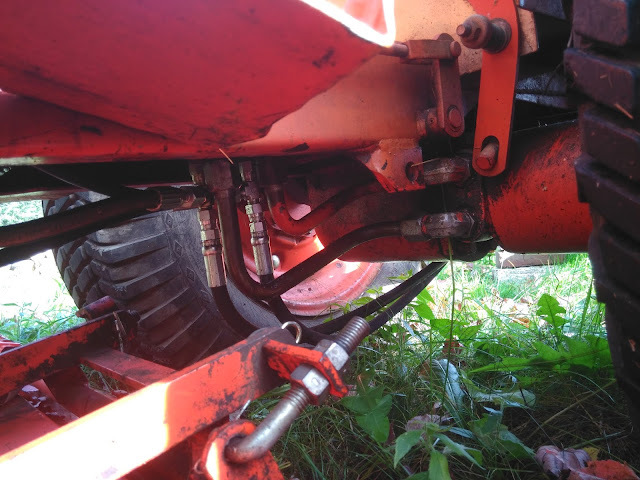 I'll have to take the axle off, which requires major disassembly off the whole backside of the tractor, in order to do what I wanted. I elected to do a quick fix, and get a braided hydraulic line made up. This way I can use the machine until I have some time to do the major surgery, though it isn't as resilient (or as expensive and hard to find!) as a new steel line. 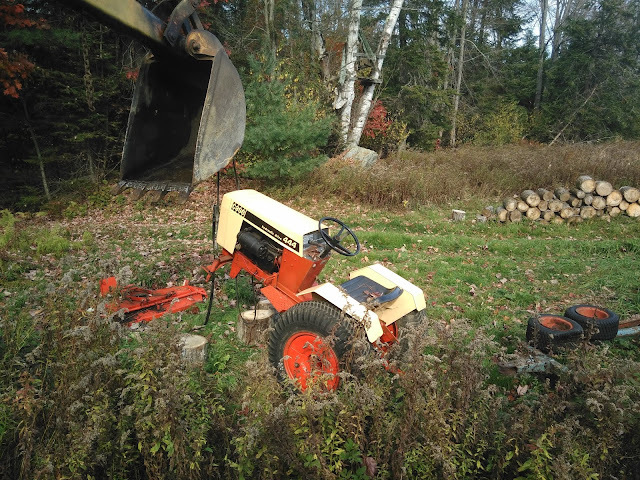 So the tractor will remain on firewood jackstands until I can get back up with a new line. Good thing the neighbors can't see... how embarassing. Back down in the city, Gavin and Mark came over to try to start Gavin's Massey Ferguson. We had replaced the battery, spark plugs, spark plug leads, checked the distributor, cleaned the carburetor, then drained the tank and put in a few cups of fresh gasoline. Online we found the cylinder firing order of the 2.5L Perkins motor (1-2-3) and we looked at the rotation of the distributor to see which order the plugs fired in. We didn't know one thing; where the cylinders were in the motor, and which spark plug lead should go where. But hey, we knew there was only three possible combinations, and it wouldn't run on two of them, so we labeled the plugs A, B and C, and started cranking. The carburetor was dripping gasoline from a stuck float and needle valve; I'll have to pull that back off and tweak it. 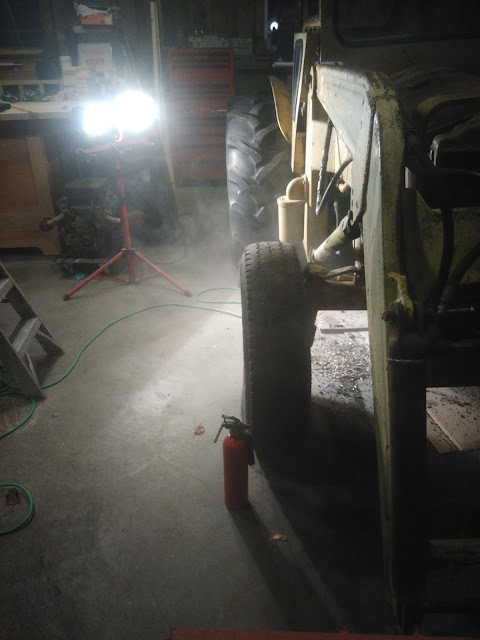 Jokingly, we set a fire extinguisher out on the floor next to us, and made a plan for who would fight the fire, who would jump in the truck, and who would connect the chain to pull the thing out and let it burn in the yard, if it came to that. Spraying ether into the open port of the carburetor, we got it going on 1-2-3/B-A-C, but it wouldn't stay running. We tried the other combinations. On C-B-A, we got a big coughing backfire out of the carburetor, which ignited the fuel vapors from the leak. The tractor now had a small fire burning around the dripping carburetor. Gavin stopped cranking. "It'll go out" said Mark. "It's not going out" said Mark. I pulled the pin on the fire extinguisher, and hit the base with a two-second burst of powder. Hero of the day; ABC fire extinguisher. Coughing through a cloud of monoammonium phosphate, we went outside and decided to call it a night. We elected to get the carburetor fixed, and go back to the B-A-C firing order.